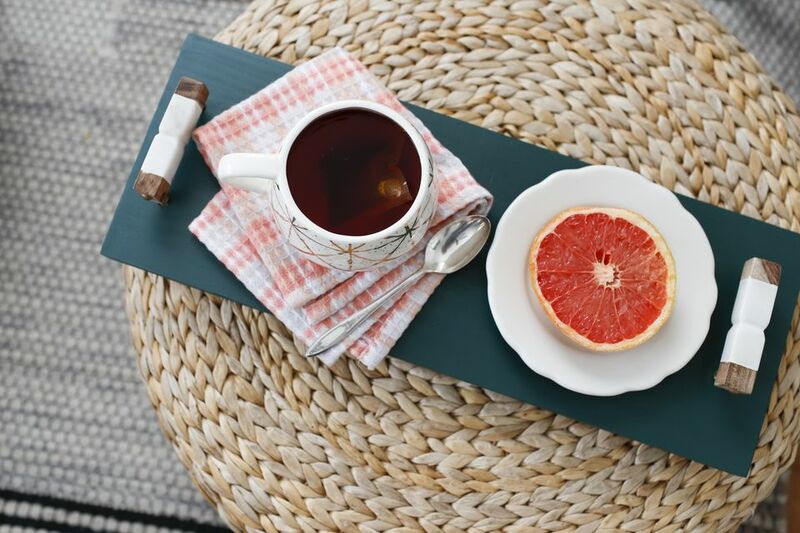 Perfect for breakfast in bed or just a catchall for your favorite perfumes or jewelry, making your own tray allows you to customize the size needed for your space. So instead of spending money on something you feel lukewarm about, here’s how to make your own. You'll just love the results! If you don’t have any scrap wood on hand, stop by your local home improvement store and see if they have anything that will work in their scrap pile. If you ask very nicely, they might even cut pieces down for you too. You’ll want to start out by thoroughly sanding your piece of wood if it hasn’t been done already. Pay extra attention to the edges and the rough ends. Sand the top and bottom lightly as well, it helps the paint adhere better. Plus, you don’t want to have to worry about splinters! Once you're done, wipe down the board with a microfiber cloth. Using your foam brush (it helps to eliminate brush strokes) paint the entire board in craft paint. Dark or light colors will look great, so choose whatever will work best for you. If you’re using a lighter color, it might be a smart idea to use a spray primer first, so the color shows up well. Let your first coat dry and then apply a second coat. Let dry completely. If you’re painting stripes or a geometric pattern on the surface of the tray, use painter’s tape. Start by painting the lightest color on the surface of the board and then layer the darker colors over top. Once you’re done, remove the tape while the paint is still wet to prevent pulling. 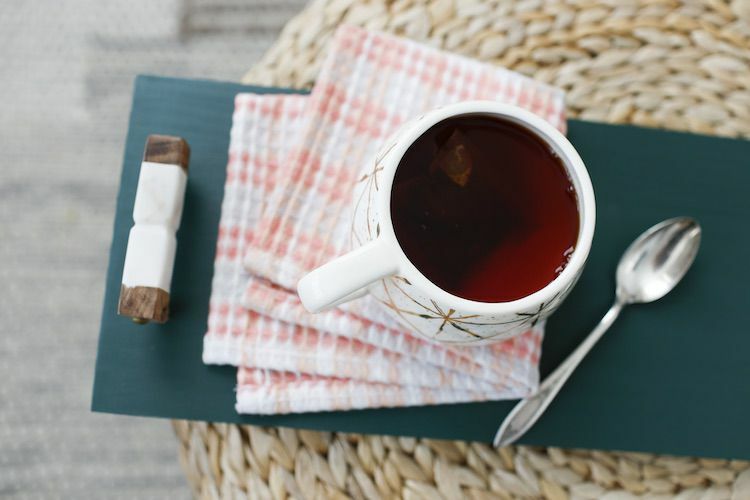 In a well-ventilated area, spray the entire surface of your wood tray with the spray lacquer. For a little extra shine/protection, do two coats. Let the wood dry overnight before proceeding to the next step. Depending on the type of hardware you choose, you’ll want to measure and mark where you’re placing the handles on each side. The hardware looks best about an inch from the edge. A little trick you can use: when you have the hardware placed where you want it, if you push the bottom screws against the surface of the board, they’ll leave an indent so you can see exactly where you want to drill the holes. Figure out which drill bit you want to use (based on the size of the hardware bolts) and carefully drill the holes you need for your hardware. Secure the hardware by screwing the nut onto the bolt. Flip your tray over and using a bolt cutter, cut off the excess so that it’s flush with the nut. To create scratch-proof feet for your tray, put a spot of hot glue over each nut on the bottom of the tray. Let cool completely.